Year to date, gold prices are down 10.5%. Gold is now poised to finish 2015 close to the near-six-year low of $1,045.85 it hit in early December. Gold prices started the year at $1,172.50 an ounce and traded as high as $1,300.70. But a stronger U.S. dollar, prospects for higher interest rates, and a slowdown in China all pushed gold prices down in 2015. The dollar is on track to end this year with a 9% gain against a basket of major currencies. The euro is lower by roughly 10% against the dollar since the start of 2015.That has made dollar-denominated gold more expensive for foreign buyers. Many forecasts call for continued strength from the dollar as well as additional rate hikes from the U.S. Federal Reserve in 2016. Those two stories will have major impacts on gold prices throughout 2016. 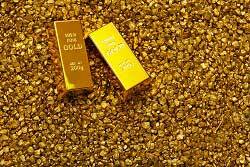 Several traders and brokerages are predicting a drop in gold prices to $1,000 an ounce or below early next year.